So . . . hands up, all you people who are hand-making toys for your kids this holiday season! Aaaaaaand . . . hands up, all you people who went shopping at amazon.com! And Target! And Walmart! And indie neighborhood toy stores! And etsy! I don't care which group anyone belongs to, really. Or if you did a bit if both. And those of you who didn't raise your hand at all because you're Not Doing The Gifts Thing this year -or any year- for any reason: more power to you. This here is the "We're Doing Our Equally Valid Best For Us, So There" club and anyone can join. I love Christmas. I don't love the minus 6 degrees and icy roads and skiddy cars that sometimes come with it but, to be fair, that's more Minnesota than Christmas. 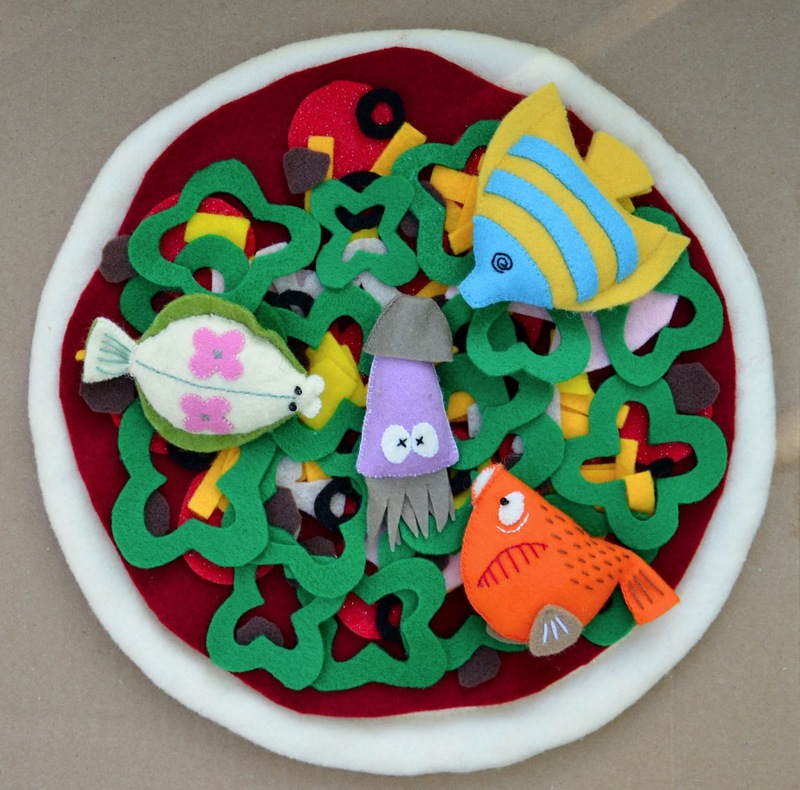 I was cleaning the kids' playroom last week and and thinking, "we really need to throw out about 80% of our cardboard stuff" when I came across their big tub of handmade felt food. 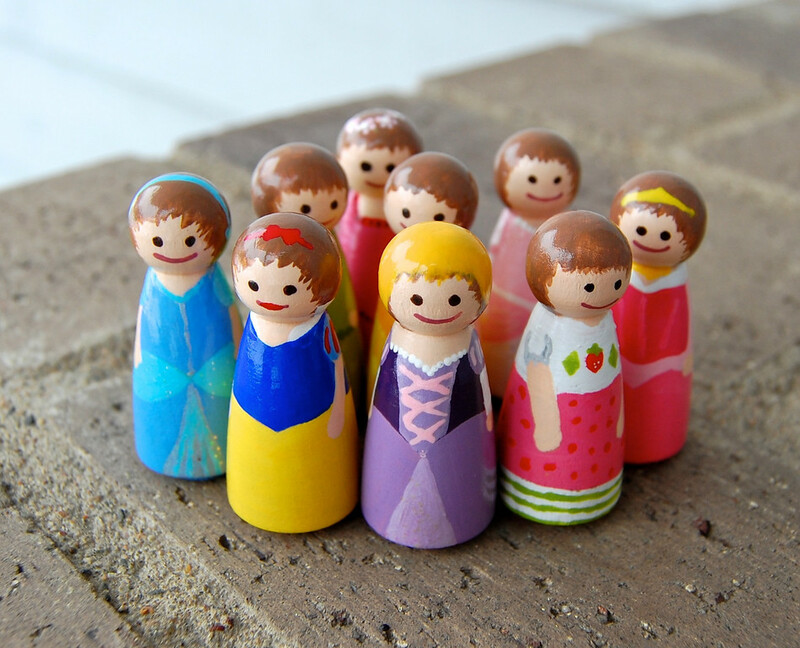 Immediately became nostalgic of when the girls were very small and I was obsessed with this crafty blog mania of hand-making toys at Christmastime. And by "mania", I don't mean, "I sewed a rag doll" or "I made some felt cookies"; I mean "I stayed up every night till 3 am since July sewing myself blind so I could produce an entire felt restaurant, complete with the actual restaurant tent that fits under the stairs and holds 20 children and which has an electronic doorbell and pager service with beeping lights just like Red Lobster and color-changing flames in the reverse-appliqued fireplace and individually-blanket-stitched squares of relish for hot dog toppings and then replicated it twice more to give to cousins and friends". Er . . . where was I? Oh, right- mania. I'm so good at that. Anyway, as I was saying, I came across the kids' tub of felt food. It is one of the most well-loved and much-accessed things in our house. Many, many hours of work went into that tub and, based on how much play the kids get out of it, I absolutely do not regret those many, many hours. Then I looked around the room and noticed the other handmade toys from years past, which the kids refuse to let me throw out because they claim they "still play with them". And I wondered if my blog readers wonder if my kids really like them as much as I claim they do. And wouldn't it be fun to do a post on that? You know, in which LiEr revisits The Toys of Handmade Christmases/Birthdays Past And Does An Honest Review? There must be rules and disclaimers, of course. For instance, I will not review toys that are my paid patterns, because that would never be a fair assessment- I'd always have a vested interest in saying the best things so you'll keep buying my patterns (suffice it to say that every single one of those Patterns-For-Sale Toys was designed in response to a need I observed in my kids' play repertoire). 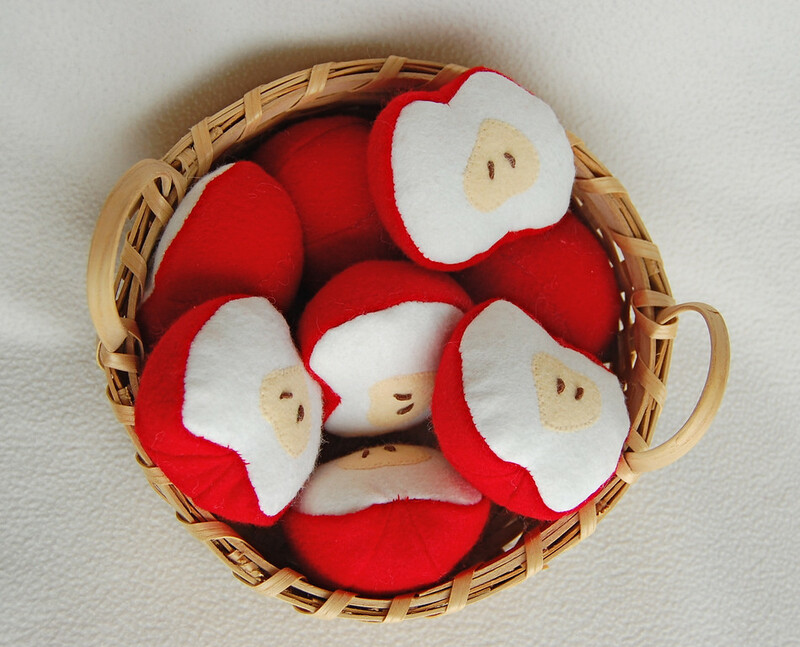 Also, I will review toys that I have made and which are original designs. 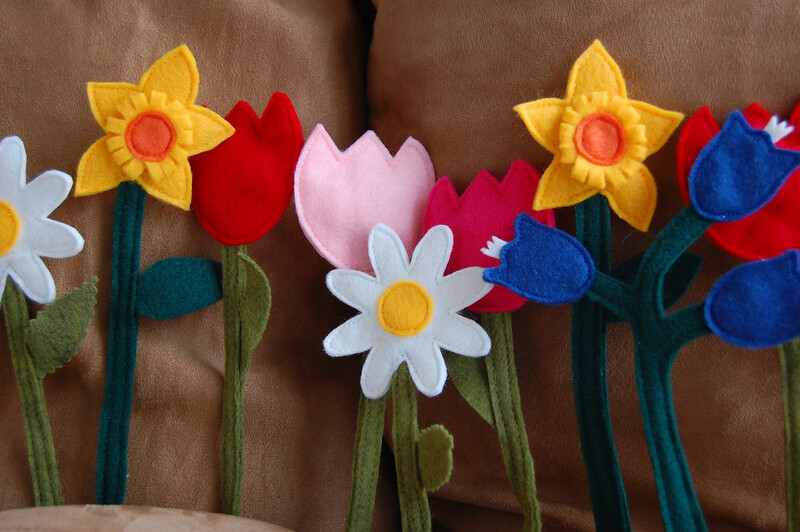 But I will also include toys I have made but that are designed by other people because my kids really liked them. Finally, some of the toys are still around in the house but others will have been long discarded because they fell apart or were just too large to keep around long-term. = SELL THIS IDEA TO A TOY COMPANY!!!! = I JUST WASTED TWO WEEKS OF MY LIFE MAKING THIS. But who has the time for that? Instead, I'm just going to show you pictures of toys and tell you how and what those toys have been doing since I made them. 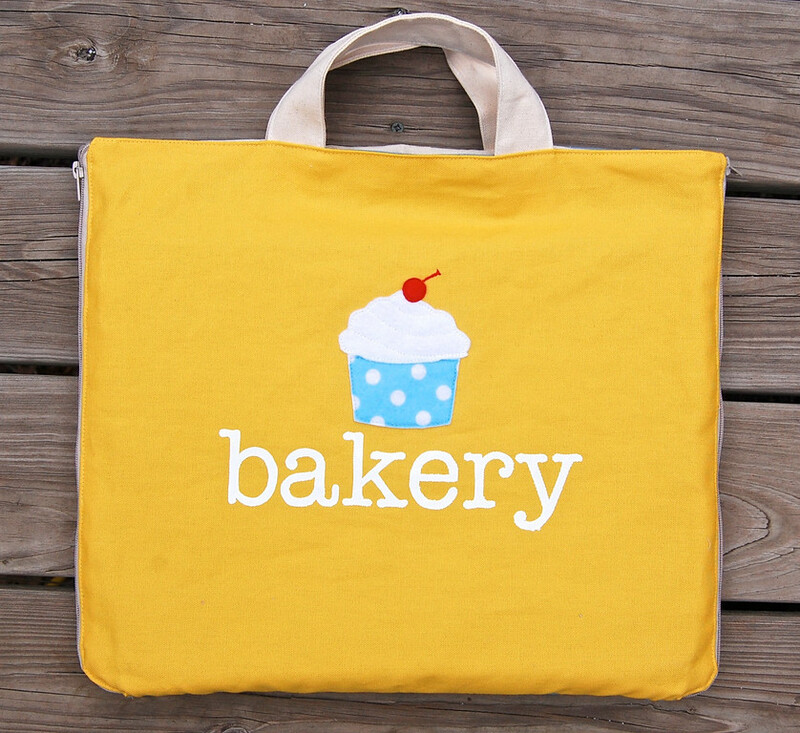 It will be like a class reunion of all the old ikatbag toys, with each trying to one-upmanship the other. Fun! All three tents are still in great condition and the girls play with them a lot. 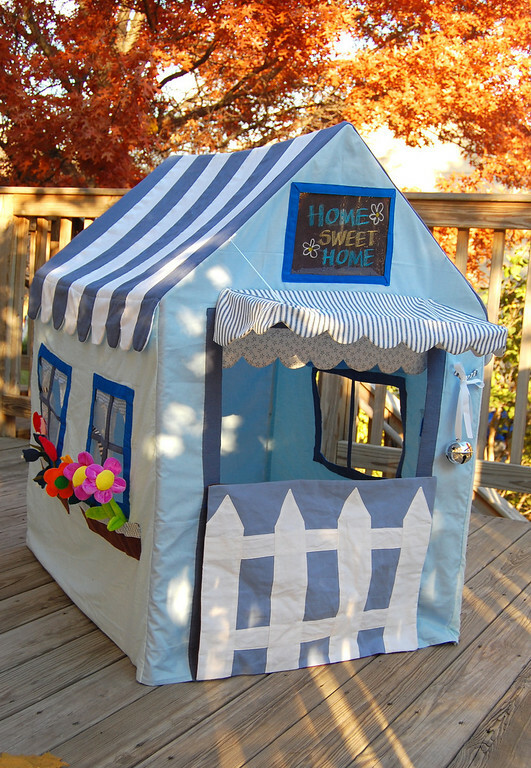 Of the three, the Little Blue House gets the most play because, being a stand-alone structure, it is the easiest to set up anywhere in the house. It is also the most spacious, height-wise, something that is a big issue as my girls get taller with each passing year. 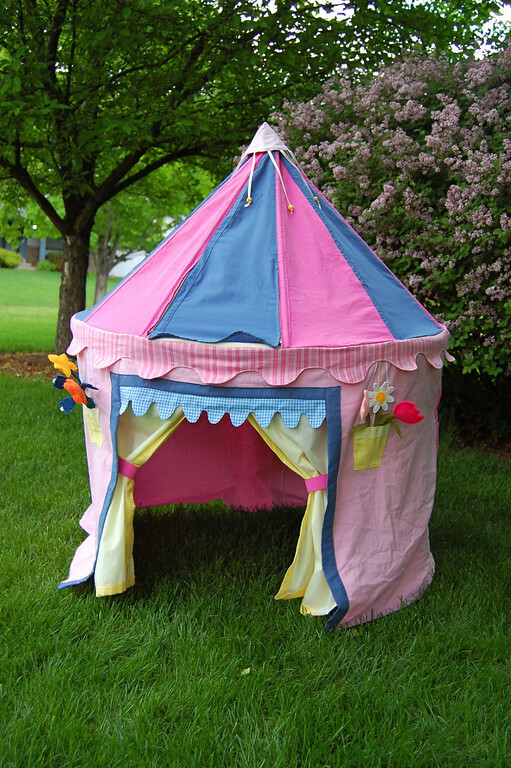 If you were planning to make a tent for your kids and wondering which kind to choose, I'd highly recommend a PVC frame playhouse, honestly. It is a lot more versatile than a table tent, which has height limits and which is rendered useless if, say, the table gets sold at your garage sale next summer. 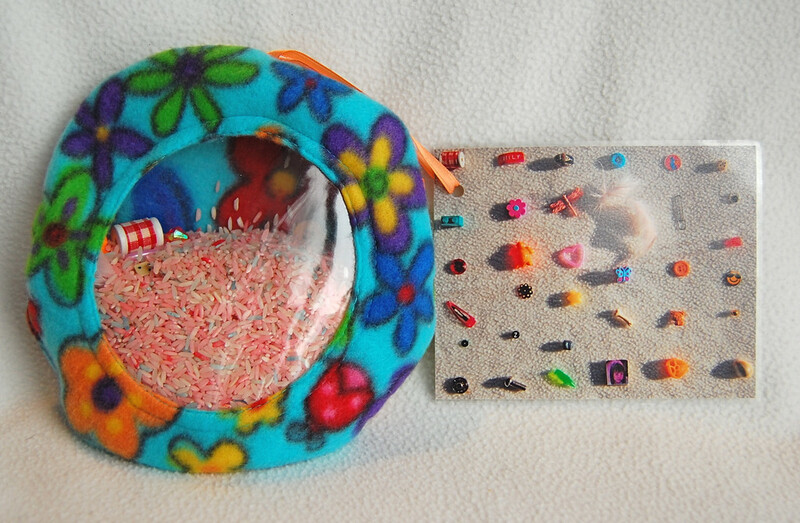 That brown foam dirt toy is probably one of the most played-with toy I've made. It gets included in an astounding number of pretend-play scenarios and has held anything from regular flowers to wands to plastic coins (impersonating seeds and/or buried treasure) and bugs. Each time the tents are set up, this patch of dirt is dragged out and an entire garden planted in it. 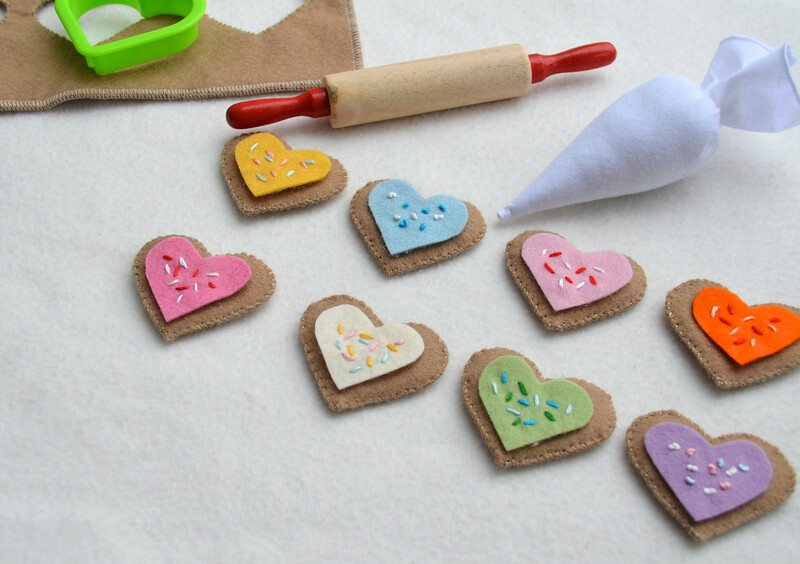 The strawberries and peapods have been absorbed into the girls' vast collection of felt F&B items and used for cake and dessert decor, smoothies, malts and grocery store stock. The girls' favorite beverage to brew is green bean tea and it is served in a plastic Cinderella teacup with one felt peapod for garnish. 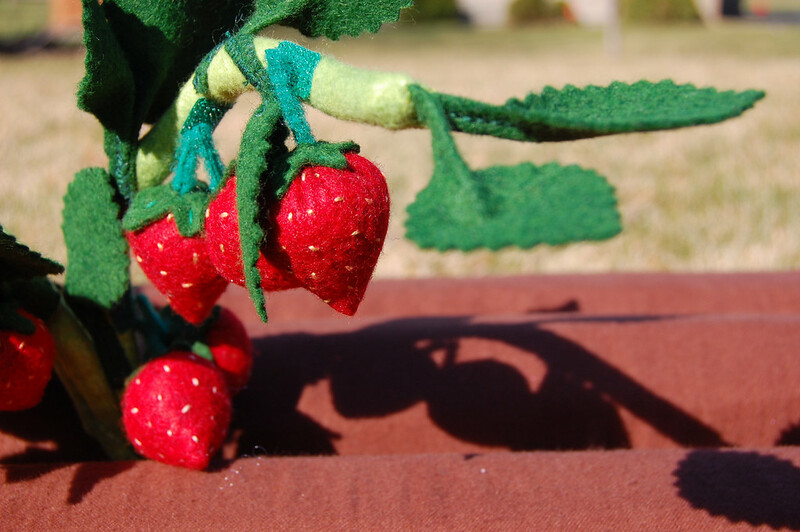 By comparison, the plants themselves don't enjoy as much play - maybe because someone has to actually velcro all the strawberries and peapods on before they can be picked. And the strawberries and peapods are usually already being used in exotic cafe recipes. So if you're thinking of making this dirt garden yourself but are intimidated by handstitching and er... hard work in general, do the dirt and the produce, but skip the plants, unless you're really into the whole U-Pick thing. Since we're on the subject of F&B, let's talk about felt food. 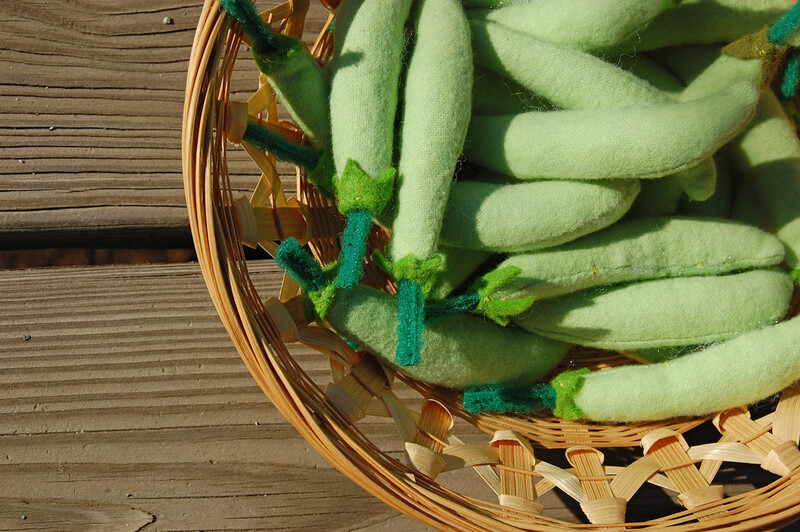 If you have young kids and have only enough energy in your whole lifetime to make them one thing, choose felt food (unless they love dolls, in which case make them both). 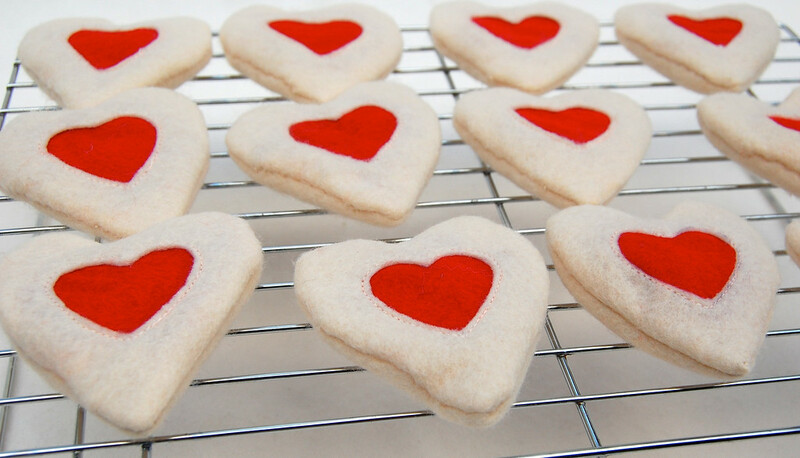 The felt food in our house is used for everything - feeding stuffed animals, cooking competitions, restaurants, supermarkets, princess tea parties, quests, just to name a few. and the cupcakes, cinnamon rolls, sugar cookies and jam tarts we made for Emily's 2010 birthday party. 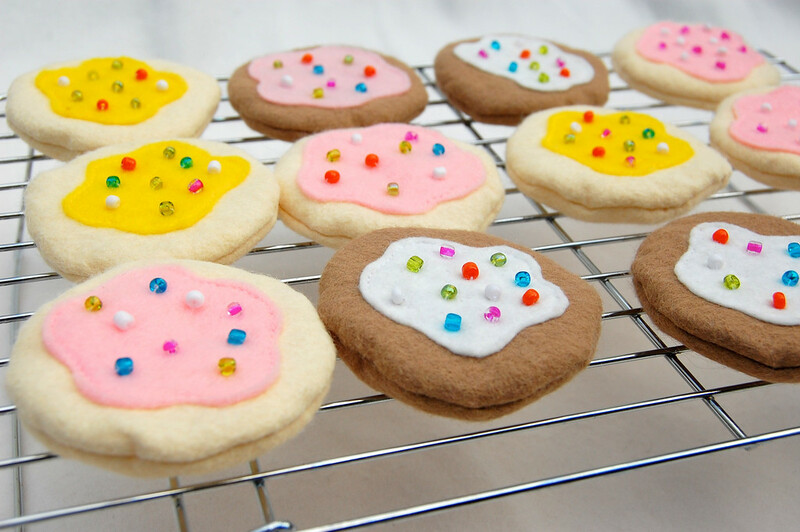 The newest felt confection - these hand-stitched frostable cookies that were originally designed by Destri from The Mother Huddle, spend half their time in their carrying bag and the other half hanging out with the other a la carte confections in various dessert cafe scenarios. The pizzas are still a hit, and are taken out every time the girls have a friend or cousin over for a playdate. The girls are- surprisingly- good at keeping the toppings (mostly) separate and organized in plastic containers, but they have complained that it is extremely time-consuming to sort them out. The cardboard conveyer belt oven does not always get included in their pizzeria setups unless they are playing in a large enough room to accommodate it. We threw out the LED-lit hood but kept have the conveyer belt for its potential to cross over to other play scenarios (as library chute, supermarket checkout, etc). 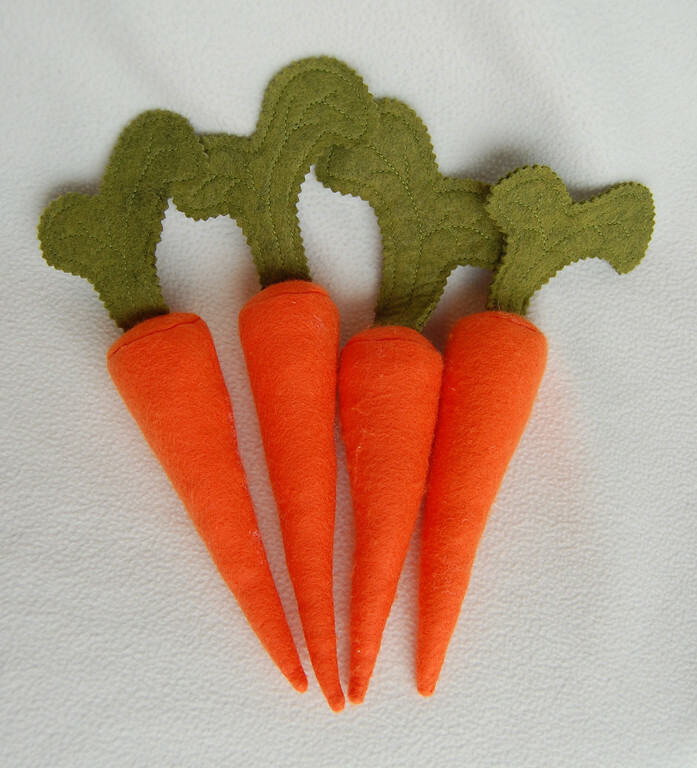 and the felt carrots are often found planted in the dirt garden and in farm scenarios along with the chickens and pigs. 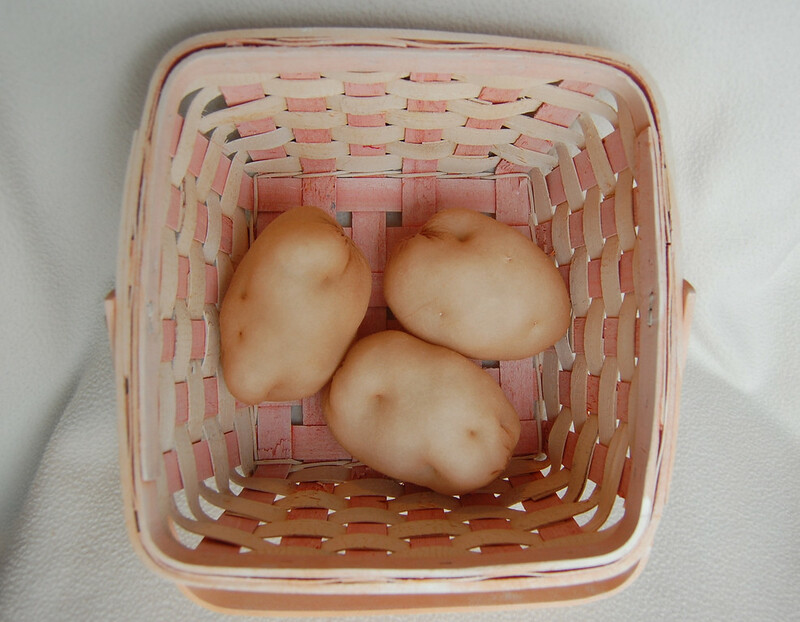 These potatoes are now mostly ripped and I haven't had time to make more. are still going strong, and the girls combine wood and felt without discrimination in their retail F&B businesses. 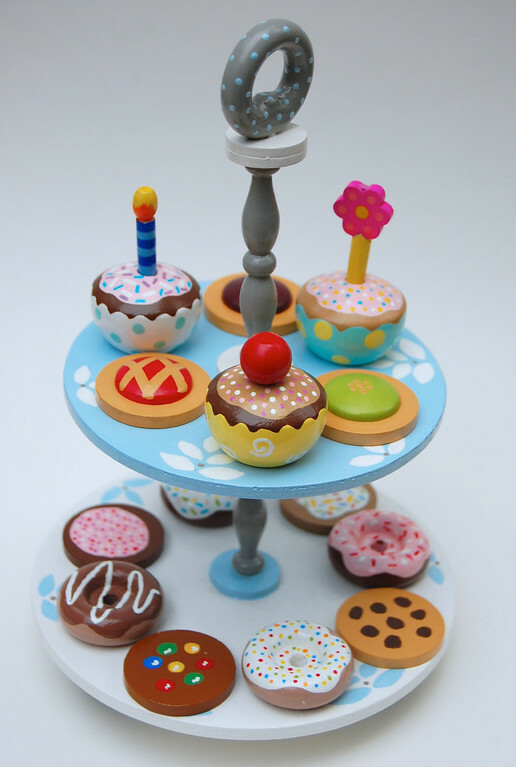 Being petite, these wooden treats also often appear at tea parties for special stuffed animals. 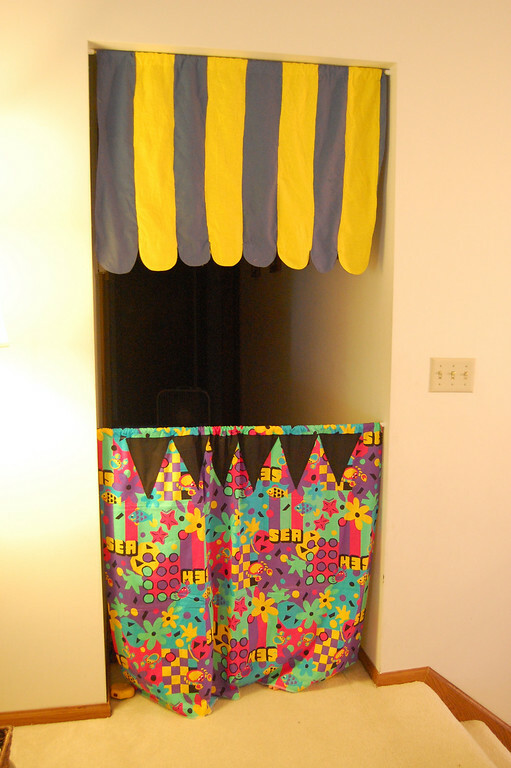 The other big tub of handmade things in the playroom is the dress-up box. 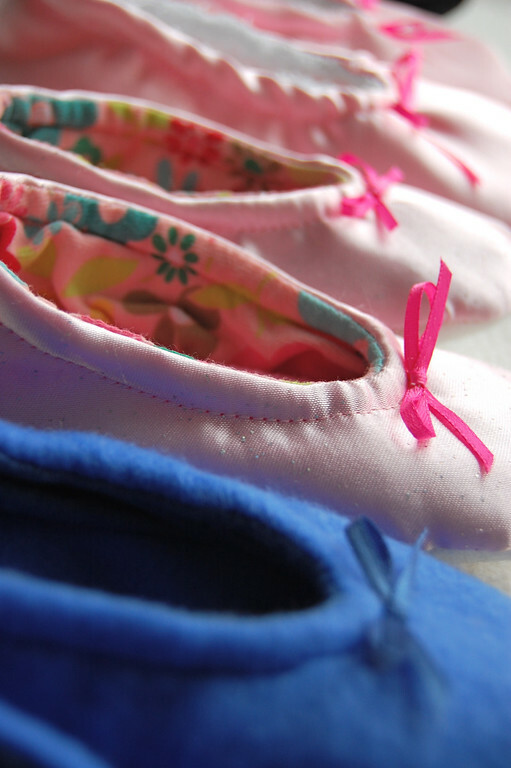 Having been made 5 years ago, these shoes are almost all outgrown, but while they fit, the girls wore them all the time to dance around the house. 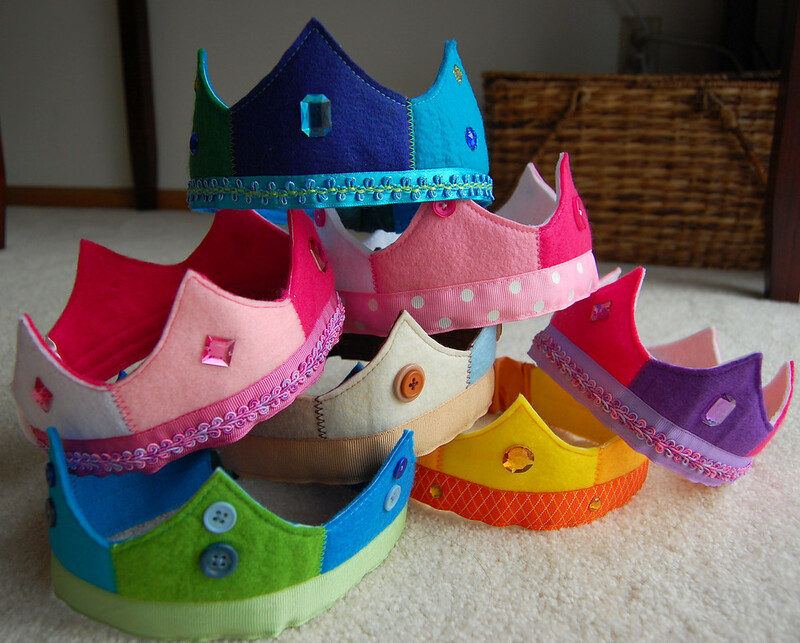 Ditto for the felt crowns. 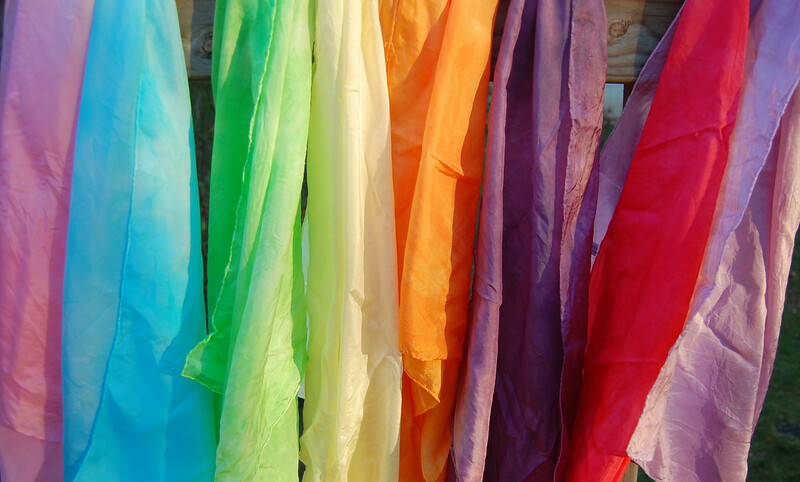 and playsilks are probably the most used items in the dress-up box. Yes, still. So incredibly versatile. 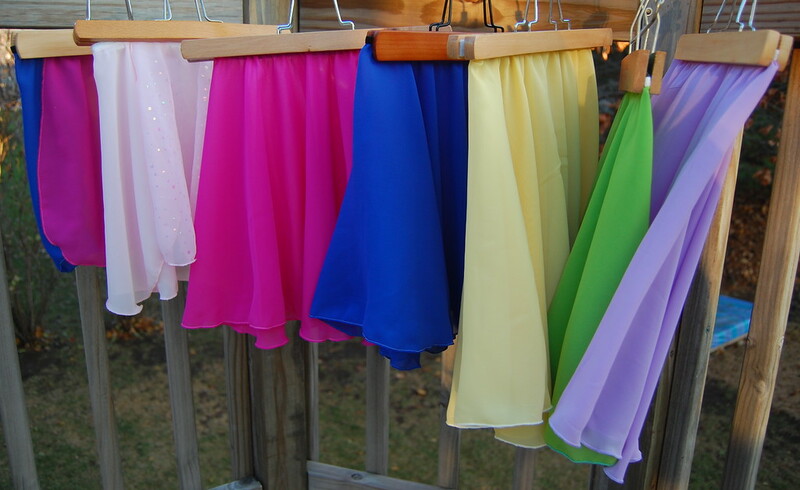 5 years after they were made, they still fit the girls -hurrah for circular drape and elastic waists! 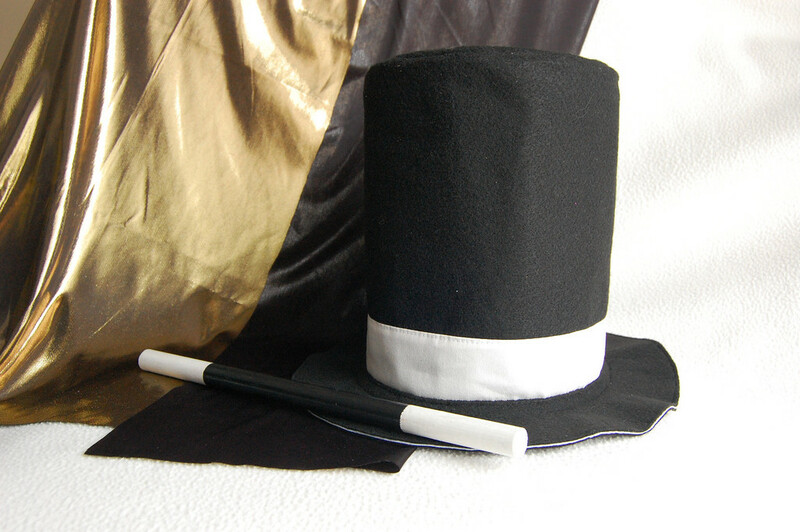 Emily, especially, loves this magician's hat with its secret compartment, even though it no longer actually fits her head (or anyone's, really). The time-intensive, much-procrastinated halloween costumes continue to provide hours of happy princess and superhero adventures. 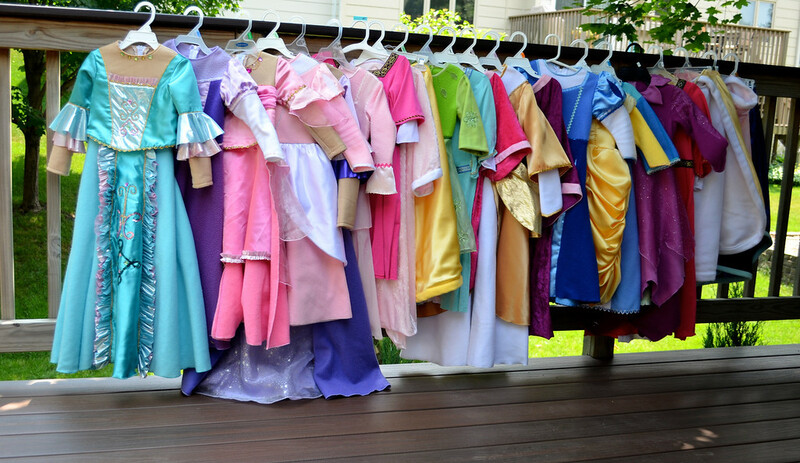 Unfortunately, at least half of them are outgrown, but the girls continue to use them when they set up Boutique (aka Dress Shop), in which they sell ball gowns, prom dresses, plastic princess footwear and fancy handbags. 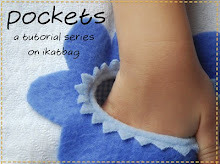 Verdict: If you're planning to hand-make a dress-up box with staying power, load up on one-size-fits-all items like cloaks, elastic/wrap skirts, or even just big flat scarves that can be tied around bodies for makeshift gowns. Especially if your kids are small and have no younger siblings to hand down to, skip the fixed-size items like shoes, masks and crowns. Kids grow faster than you think they will and most of these will be obsolete within a year or two. Softies now - and these are just some of them. 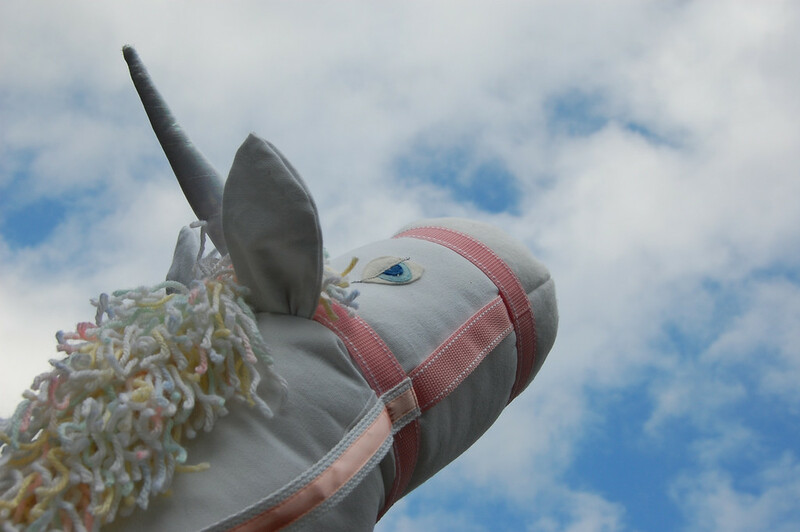 Of the original three, we only kept Jewel the unicorn (the one above has gone to live with Emily's best friend), but she stars in quite a few re-enacted Narnian stories. 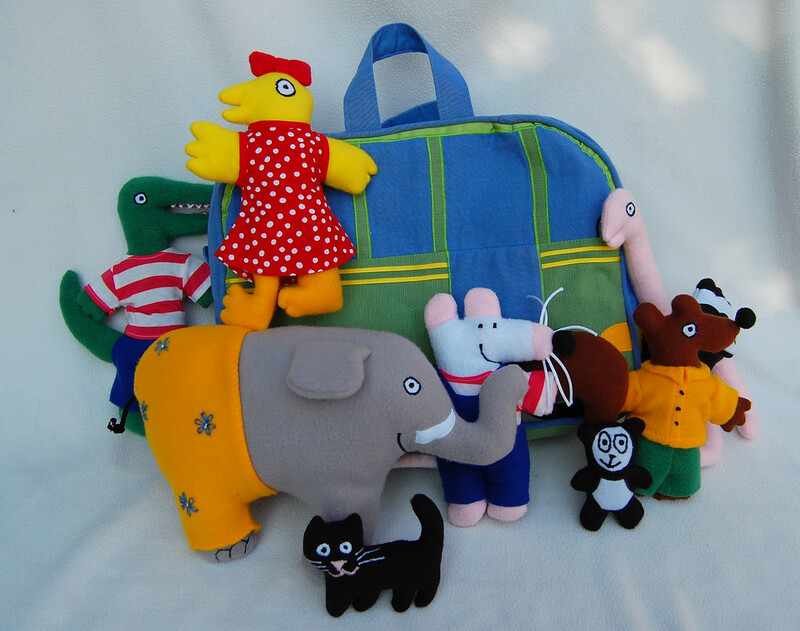 Maisy and her friends - perhaps the ikatbag item most frequently requested in etsy convos, after the Owie Dolls, - still live in their Bus Bag in our stuffed toy storage tub. The girls don't play with them anymore, especially since Jenna has left her Maisy phase behind her (sniff). But we're saving them for sentimental reasons. And in case you're wondering, I've never made a second set for anyone else. 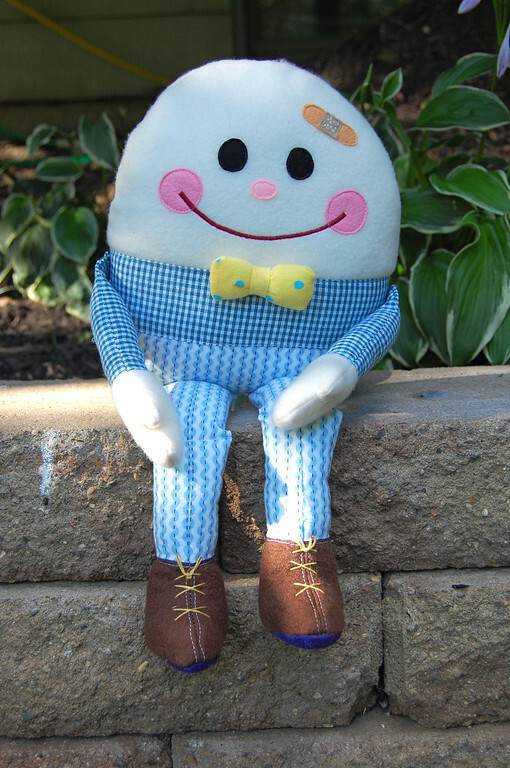 Like Maisy, we still have Humpty. The girls are no longer fascinated by nursery rhymes, so they only regard him as a fun thing whose limbs detach. He sat on their beds for a while, usually missing an appendage (or four). Even when they were little, they thought he was cute but not particularly endearing as a lovie, probably because his shape made him awkward to hug. Bunny goes everywhere with Kate. She also now looks nothing at all like this picture below. 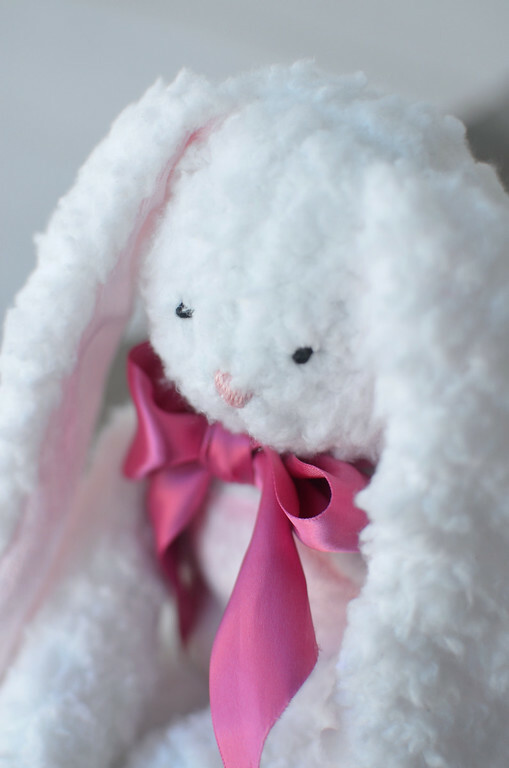 Kate recently saw this photo and was absolutely distraught that Bunny was no longer white and fluffy. We explained to her that much-loved stuffed animals very seldom retain their fake-pristine original looks (kinda like real-life Mothers) but she was still sad. The playsets now - those all-in-one toys that usually come with a carrying and storage bag and, as far as labor goes, are madness personified. Kindergarten first - this is one of those toys over which I suspect mothers and grandmothers will ooh and aah more than the kids will. Don't get me wrong - my girls love this set, but they don't play with it as much as they do their more open-ended toys like their felt cake and dirt garden and tents. It is the toy they still reach for whenever it is their turn for show-and-tell at school but I'll confess that I am the one who will, from time to time, open it up, set out all the little desks and plates of cheese sandwiches and sigh. The magnetic bakery, another show-and-tell favorite, gets more playtime than Kindergarten, probably because it is more open-ended. 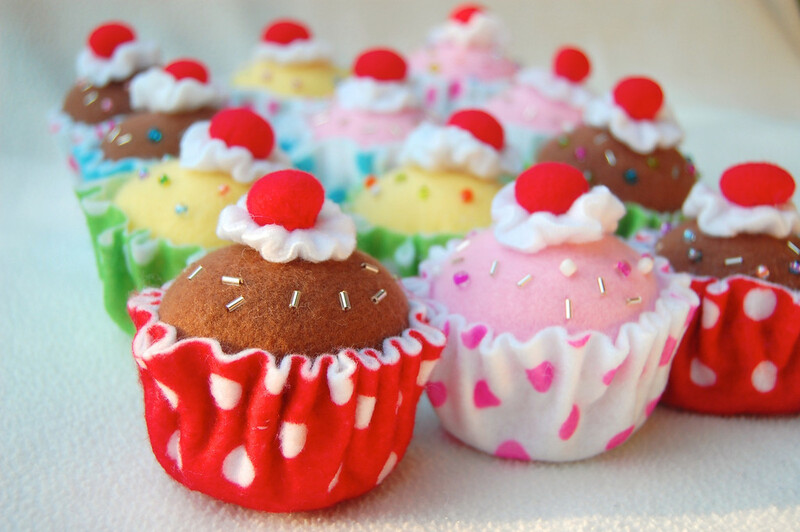 Its confections theme - which the girls clearly hold in high esteem, as you would have noticed - doesn't hurt, either. 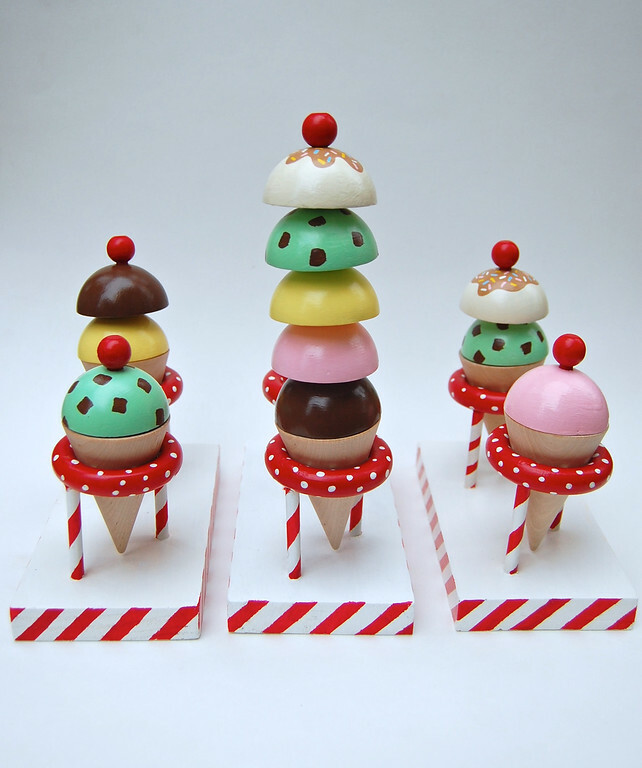 It often gets included in their F&B retail businesses, along with the wooden and felt desserts. 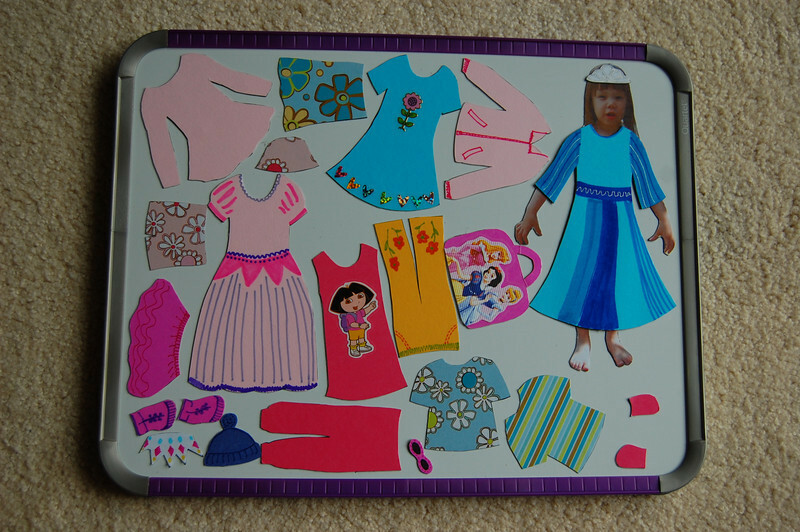 Our old felt board is creased and pilly from years of play, especially when the girls were in preschool. We have most of the felt shapes, all stuffed in an oversize ziploc bag. 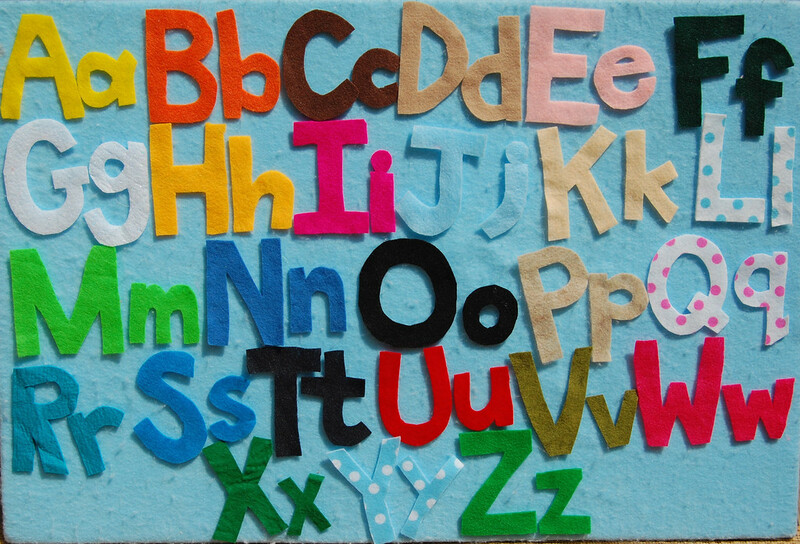 The alphabet letters were more aesthetic than practical - the kids thought they were colorful but almost always picked the more open-ended shapes over them. Which goes to show that attempts to make a toy officially educational is not a good idea; best to let it be a toy so the learning can happen in oblique and more charming ways. This I-Spy bag was a surprise non-hit. I saw it at a craft fair some years ago and came home to make my own, with a pictorial guide because the girls were not readers at the time. They now sit in the playroom and only get touched when we need to move them out of the way to get something else. I'm thinking that I should stuff it in my bag at our next doctor's visit and pull it out in the waiting room. Who knows - the novelty of a neglected toy might give it a new lease of life. 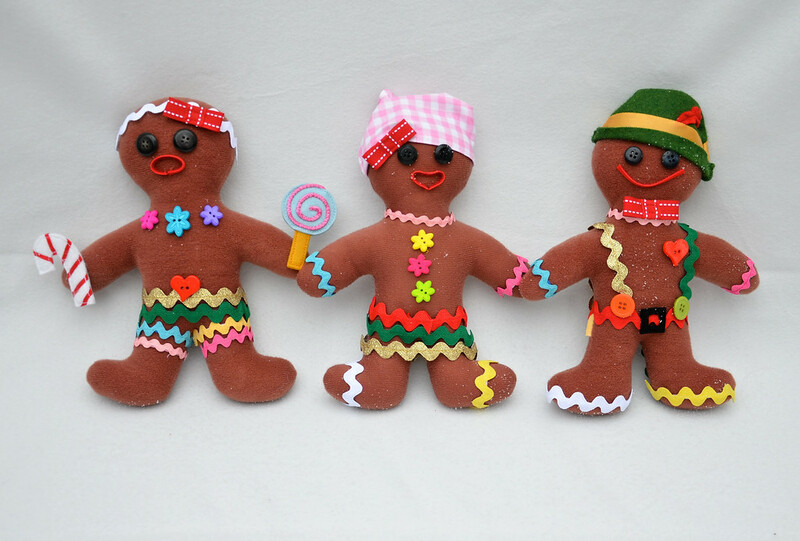 Our gingerbread dolls are advent-only toys and the girls always look forward to taking them out when we unearth all our Christmas stuff for the season. Much loved, but because there are three dolls and only one set of accessories (they were samples and muslins), the girls have had to share facial features. Not ideal, they say. 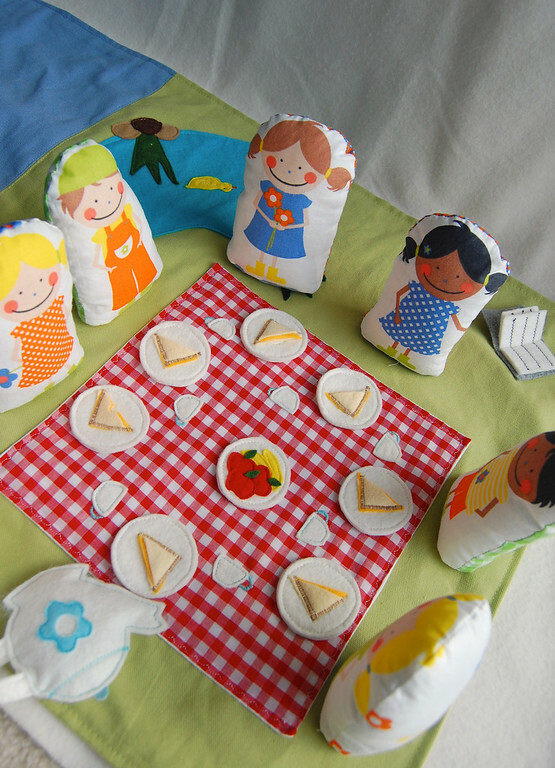 This magnetic doll set was the first toy I ever made and blogged about here on ikatbag. Both Emily and Jenna loved their sets (Kate was not born yet) and played with them all the time, until they outgrew the entire paper-doll phase and moved onto actual dolls to dress up. We still have our sets, but the magnetic boards have been poached for the extra trays in the magnetic bakery playset. 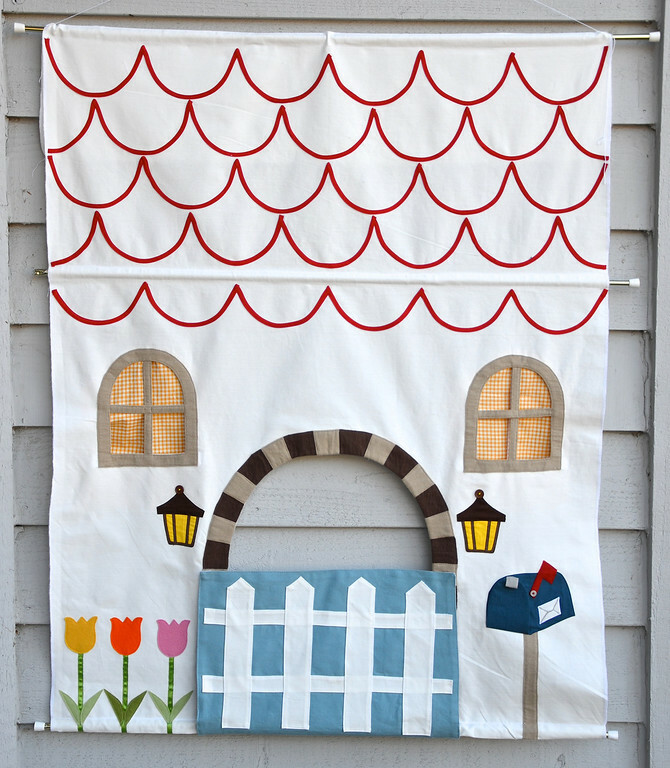 This tension rod puppet theater is an oldie-but-goodie. We use it more than I thought we would- every time I think we can toss it out, it will appear hung across the hallway or kitchen doorway, hiding small giggling children making up stories with their hands. Just a few days ago, it was out again for a puppet show for the family. I love that the girls still enjoy puppetry - their plots and dialog are more sophisticated now than when I first sewed this, and are so much fun to watch. And now- finally - cardboard! 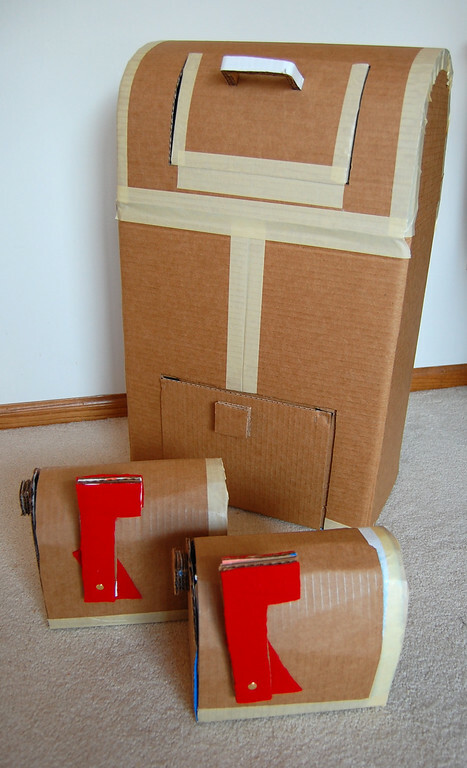 Whenever I make cardboard toys with and for the girls, I usually have a very short lifespan for them in mind, particularly if they are large items. The girls are always disgruntled at having to toss any out, so I have to constantly remind them, "the fun is in the making, girls." 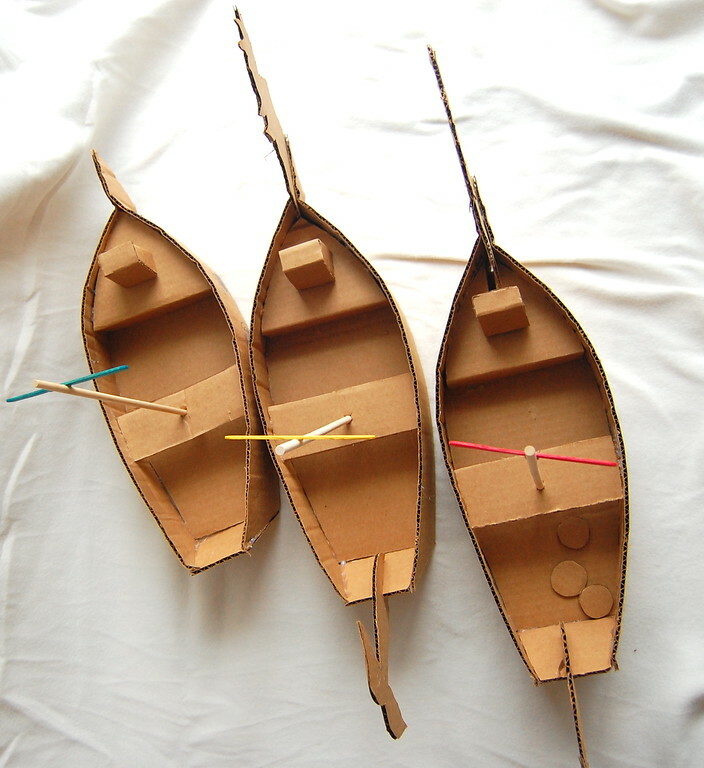 We made these Narnian ships some years back and played with them till the sails faded and ripped and we grew tired of sea battles. Then they went in the recycling bin. 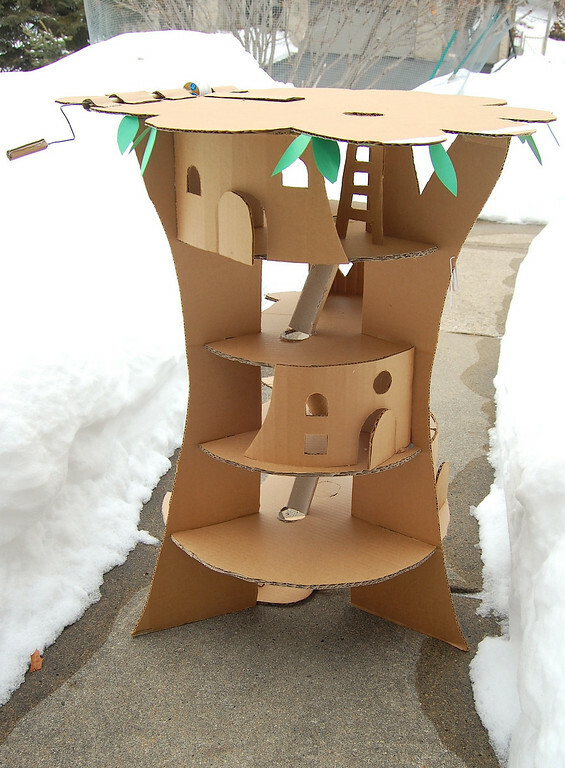 The cardboard maildrop is the cardboard toy for which I receive the most requests for a tutorial or pattern (but no, I have no time to make one right now). I am not surprised - the girls still use it for mail, ticket booths, library chutes, restaurant trash disposals and a whole host of other roles. 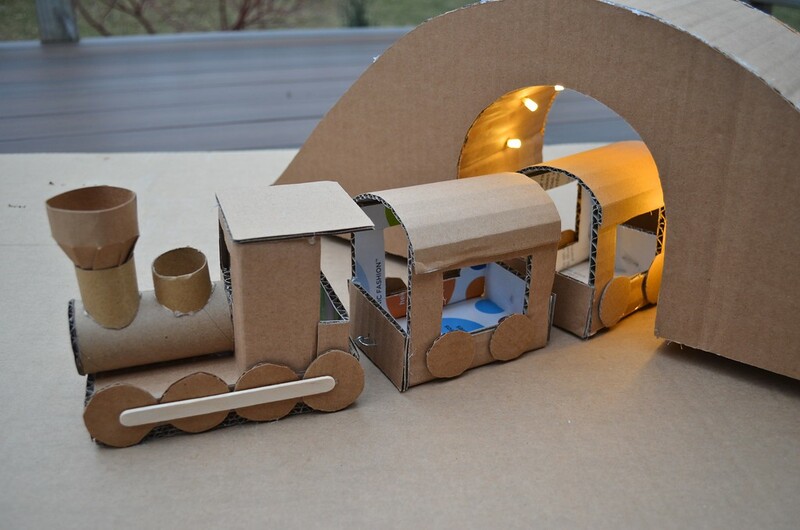 These cardboard suitcases also get a lot of playtime. The clasps have fallen off and at least one lid has become detached, but the girls refused to throw them out, so we keep them in a corner of the playroom, nesting in each other to save space. I still find them, in the aftermath of a Daring Escape Adventure, filled with playsilks, dress-up clothes and plastic shoes (and sometimes fake food). This tiffin carrier is really my toy, but the girls use it for holding fake food a fair bit (they especially like that the containers stack). This two-way easel got a lot of use when Emily was in her Let Us Homeschool Our Younger Sisters phase. It was quite successful, incidentally - she taught Jenna to read. Now that she's too busy with her own real schoolwork, our easels sit closed most of the time, employed only as occasional menus and signs for a felt food restaurant. Ah, this greengrocer shop. Despite several strenuous attempts to throw it out (it's huge), the girls have refused to part with it. They claimed - and it is true, from observation- that they use it all the time. Especially the front cubby-hole compartment, Jenna explained, which she uses for shoe displays in her Boutique. I am desperate to dispose of it, just so we can see the rest of the playroom, which is now hidden behind it. 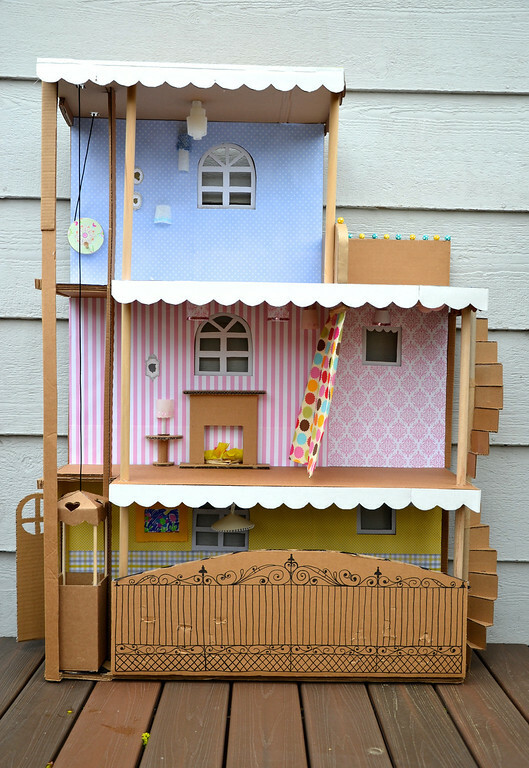 The Barbie House still lives in the girls' bedroom and looks pretty much the same as when we made it, except that the elevator shaft supports are bent and wonky, adding an exciting bungee element to the elevator's ascent and descent. 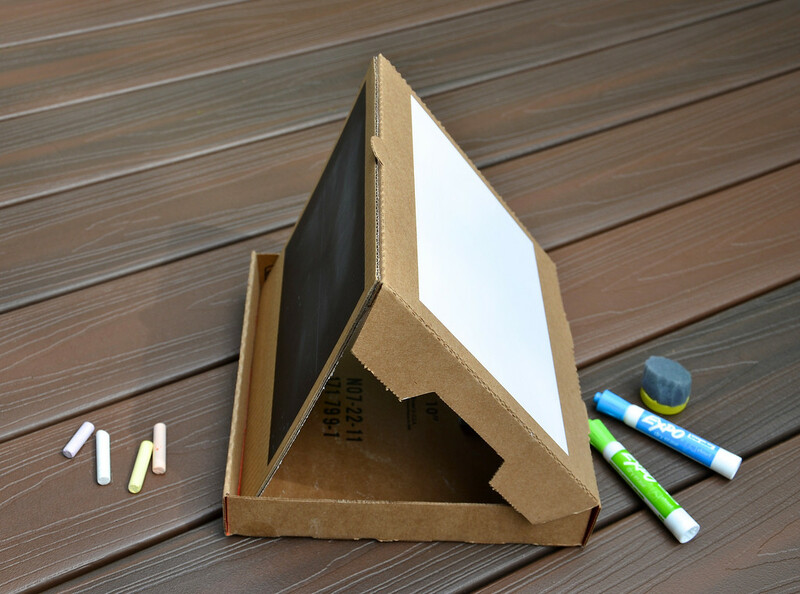 I expected that, when I chose to use flimsy cardboard for that particular portion instead of more sturdy paperboard. Oh, well. The girls have provided the feedback that they wish this House could be permanently stationed in the middle of the living room so they could build a town around it and have lots of space to play. Not likely to happen anytime soon, so they play with it against the wall in their room. 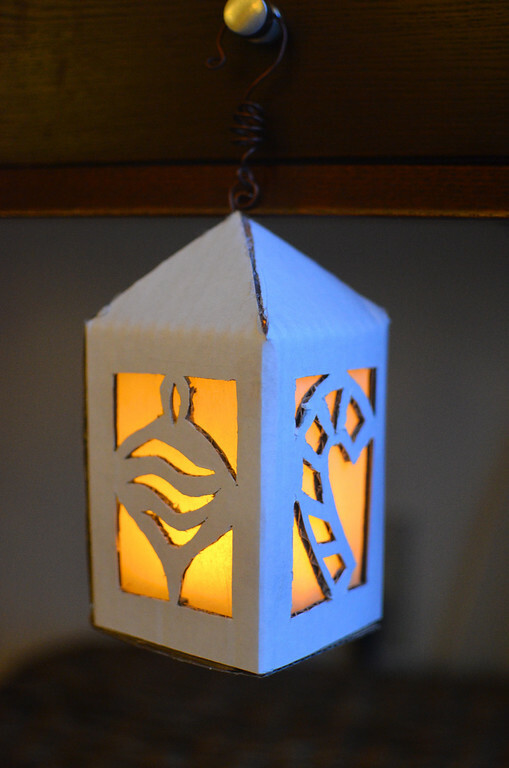 This little lantern, that I made as a blog sample for the Lights Project, turned up in a surprising number of playtime activities. The kids liked that it was portable and could be hooked onto things, so they used it in their restaurants, tents, greengrocer shop etc. We still have it, but the light's out and I haven't been bothered to open it up to replace it. 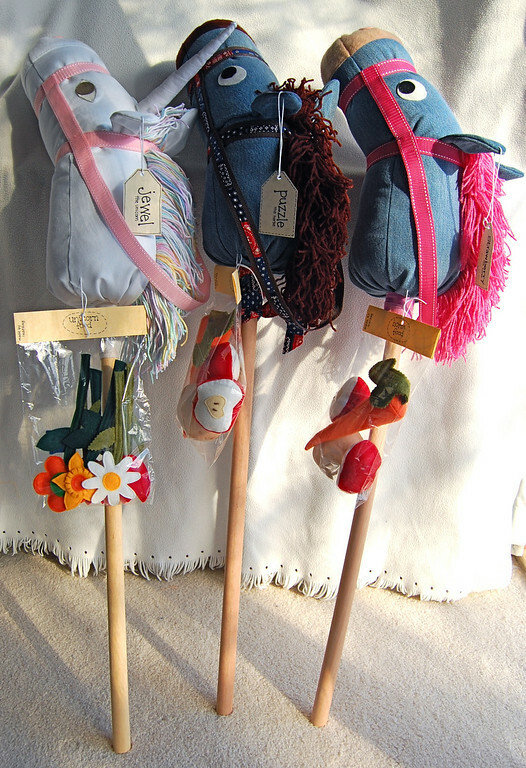 along with Kate's much-beloved collection of wooden pegs. Trainville was such a space-hogger (as expected) that it had to be thrown out earlier this summer. We kept the engine and cars but threw out the stations and bridge. I think that if I had sons, we'd have enjoyed this a lot more. 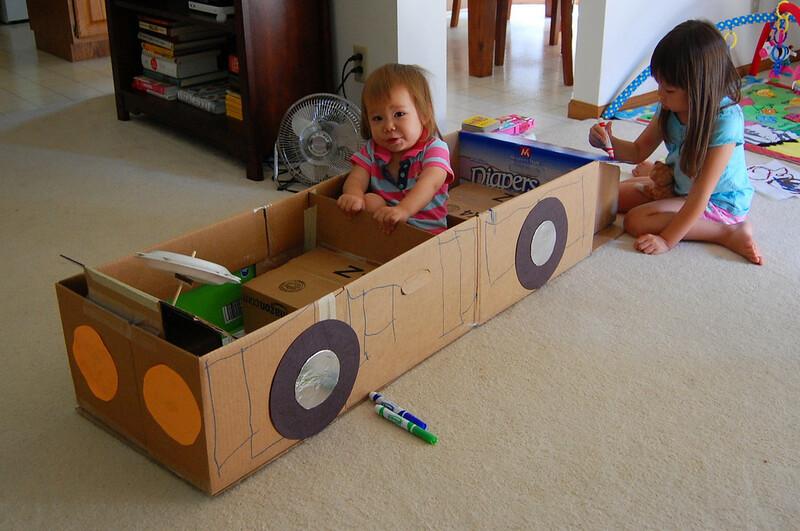 This car is long gone, but the girls absolutely adored it, even when the paper-plate steering wheel fell apart and bits and pieces started to rip. Look at Jenna- she's so tiny! They still talk about this car now, and wax nostalgic about it, usually in the context of, "We need a bigger house with an entire basement for cardboard toys." 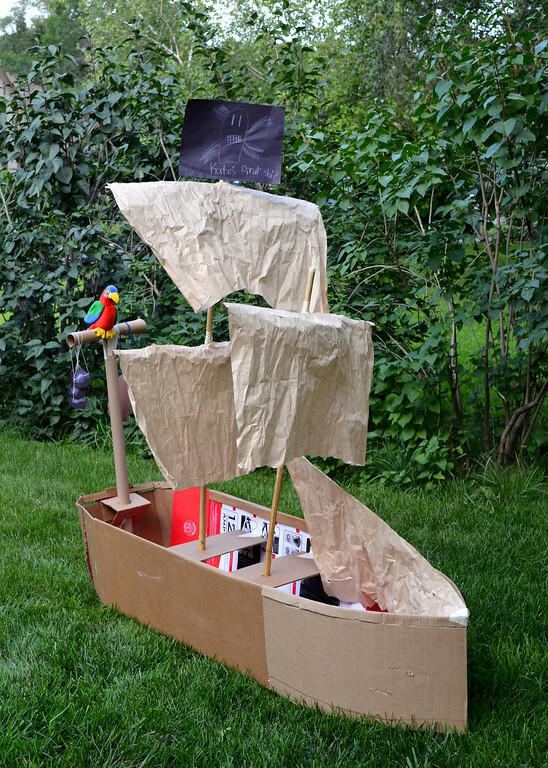 We donated this pirate ship (minus the mast) to the girls' preschool so the kids there could enjoy it long after we'd stopped. Again, this was one of the If It Were Smaller, We'd Keep It toys because the girls liked it a lot. 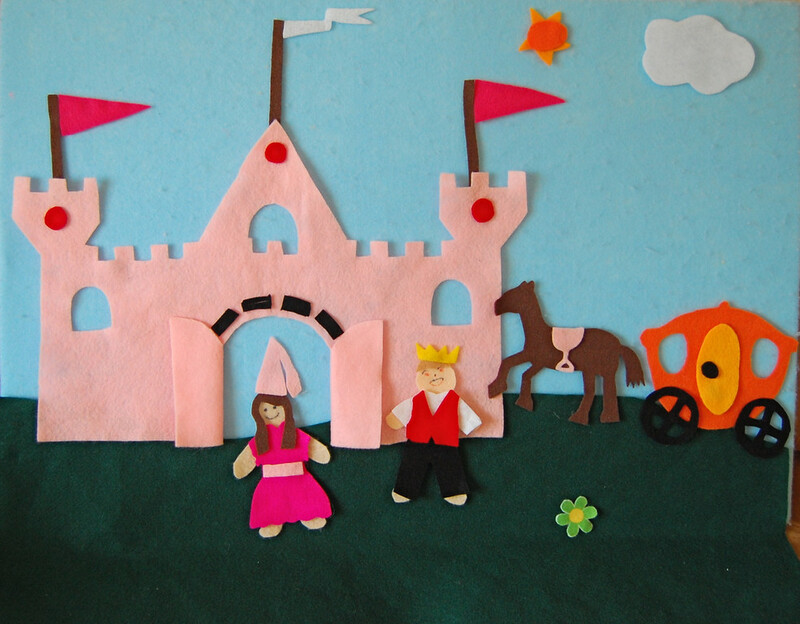 The consolation is that we made it together, as we do many of our cardboard toys. And since at least half the fun was in the making, we don't feel so bad throwing out the product when we want to make room for the next Making Experience. 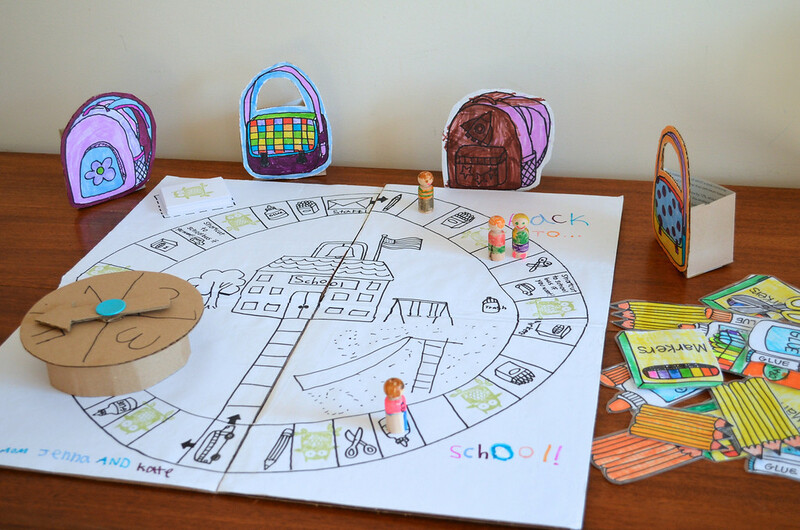 By that same logic, we don't play with this board game as much as when we first made it. Emily made this for a school project and we truly had a blast putting all the bits together. The spinner, if I may say so, is still awesome, and I might borrow it for our other store-bought board games that come with inferior spinners. 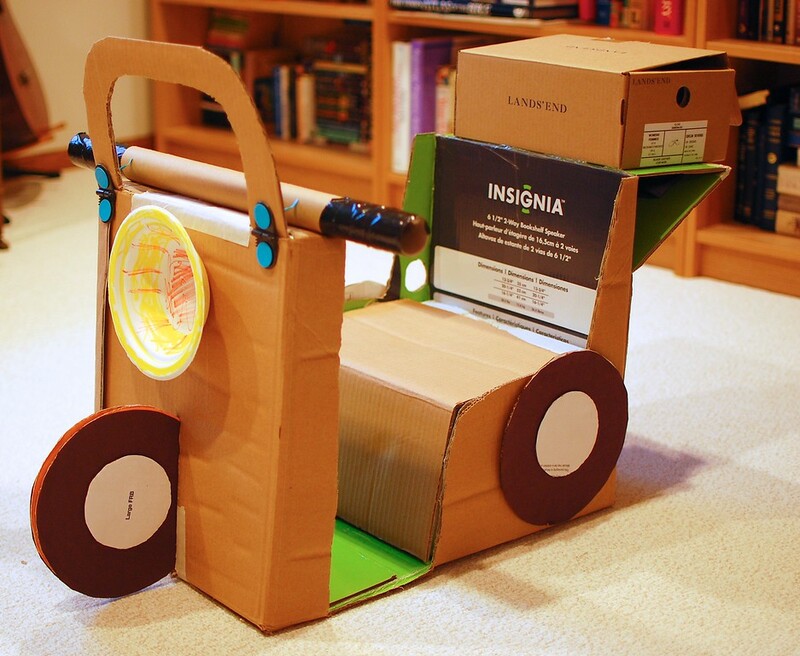 This is a scooter from our Busytown-inspired crafting some years back. The girls and I spent at least two days building vehicles and a complete auto service center in the dead of winter. Loads of fun, but we had to throw everything out not long after because it was just so huge. I don't think the girls have forgiven me for it, though. 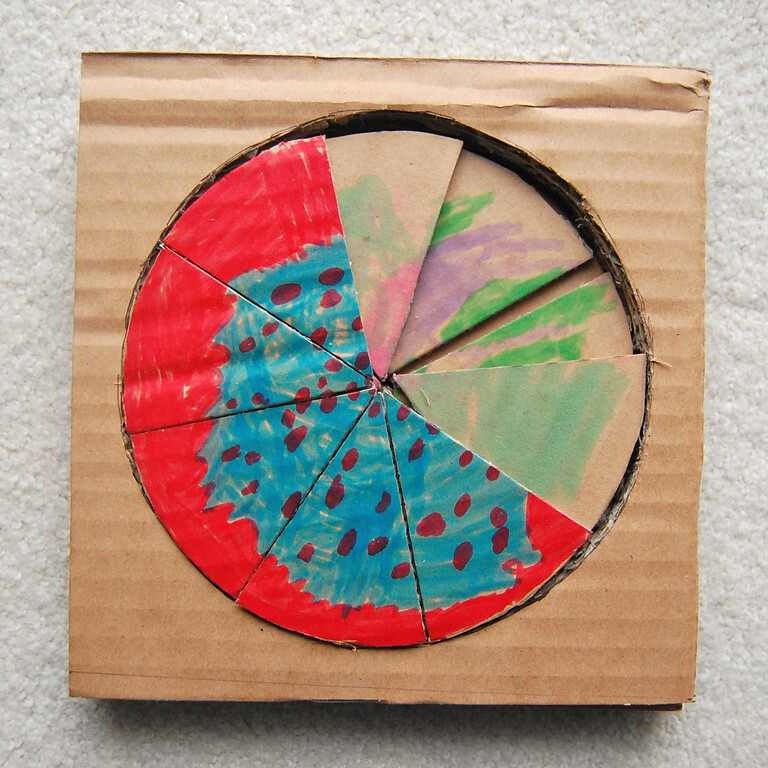 One of my favorite simple cardboard projects- cardboard pie fractions. Sneakily educational, too. If I were homeschooling, I'd definitely use this as some kind of teaching tool. Or use a real pie. 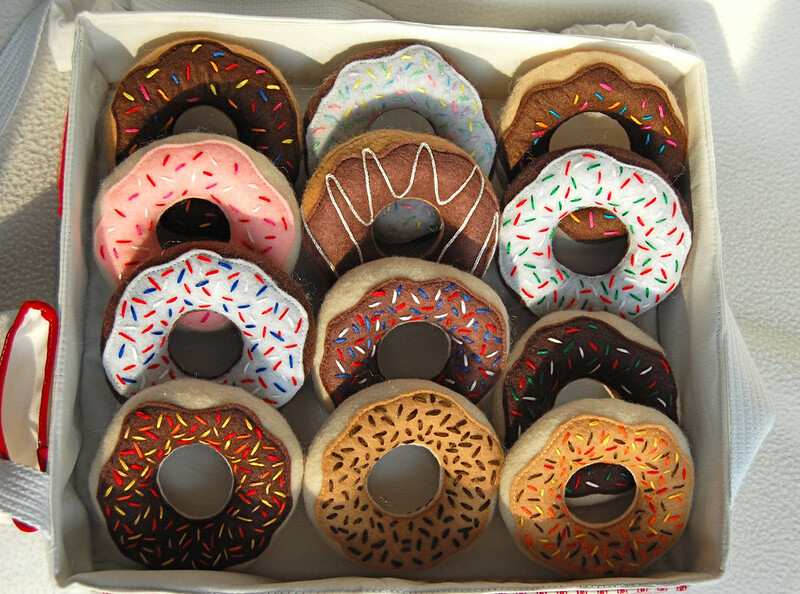 That we would eat. Yum. 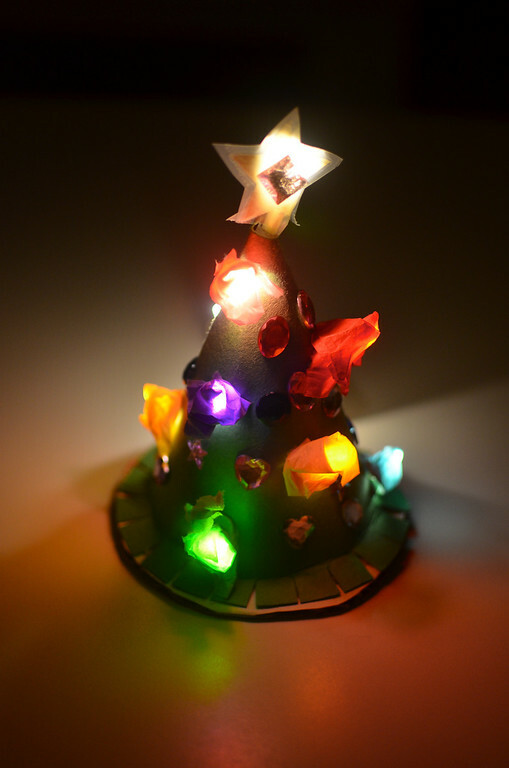 These Christmas tree nightlights are still sitting on the girls' bedside tables. I never imagined they'd continue using them all these years, but they do. 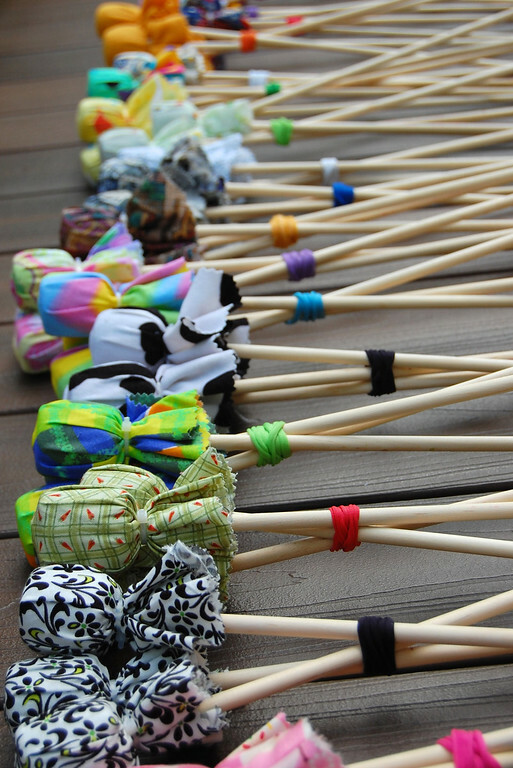 And finally - an update on those bows and arrows we made for Emily's archery birthday party in 2012. The girls still play with them all the time, sometimes even indoors (we forbid actual arrow releases from the strings) and when their friends come over for outdoor playdates, this is the favorite pick. 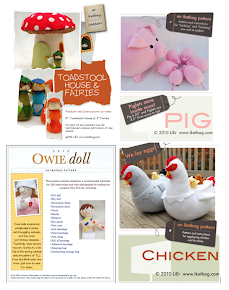 So there- my round-up-and-review of handmade toys from the archives. If you're curious about a toy that you don't see featured here, shoot me an email and I'll see if I can give you a quick update. And what handmade toys are my kids getting this holiday season? One cardboard thing and several very simple, non-manic fabric things is all I dare to reveal at this point. 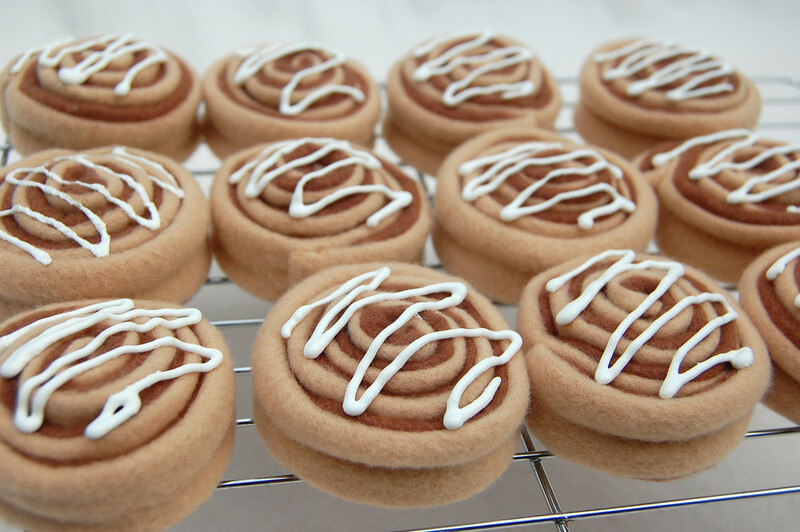 I wish I could share them now but the kids read the blog (sneaky)! So it will all have to be under wraps till after Christmas. Till then, Merry Christmas! Drive safe and stay warm! If I were a kid, I'd want to come play at your house! There is no plastic! Everything looks touchable. ps. 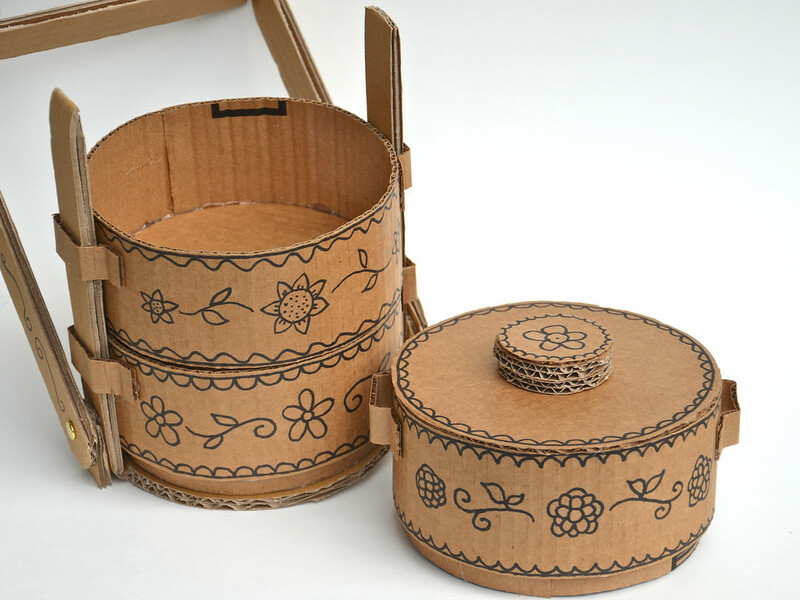 we made our first cardboard craft this week - nothing like your elaborate creations, but still fun and enjoyable and good for beginners: https://sovanisa.com/?p=1380 Thought about ikatbag while making it! This is absolutely amazing ... I have never seen anything like that! How do you know how to do this? So beautiful! Your children are so lucky, I hope they appreciate it! Yep, WOW! Describes it all... yet doesn't begin to say enough! WOW!! amazing! I love your creative toys and your attitude about them. Wish my kids and I could play at your house :) Merry Christmas to you. What an amazing round up of years of toys. So many incredible ideas. By the way, we have a few loved to pieces cuddly toys too. We read a book a few years ago called "That Rabbit Belongs to Emily Brown", which is all about how toys that have been truly loved are floppy, grubby and might be missing bits. Both my girls loved it. Katie - we just checked that book out from the library, at your recommendation, and my Kate LOVES it. Makes me read it every night. It is a gem! Thank you! I am stunned by how many things you have made with your children. I was in and out of the work force when my son was little as I was a preschool teacher who mostly worked part-time. I am in awe about how many wonderfully creative designs that you came up with. You are definitely shaping their present and future with the environment you have helped to create. I adore all the things you make. You are so talented!! oh. my. god . !!!!!! so impressive to see all of it in one post !! Thank you for sharing all of your ideas with us - I find them tremendously inspirational! 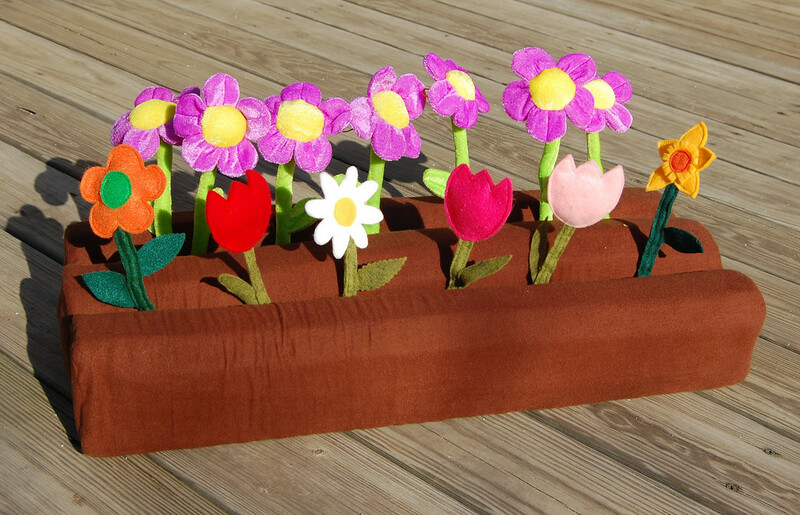 That fabric garden was the post that first really caught my eye, all those years ago. And there are so many other things you have made that I simply adore. I don't make anywhere near as many things as you do, but reading your blog always makes me smile, and you have taught me several things about sewing - and drawing! I am very grateful! This post was much fun to peruse as I munched a fresh-baked muffin and sipped mostly-hot chocolate-coffee. My kids are BIG now and Christmas/toy joy is different now....thanks for taking me back to those fun homemade-toy-love days! 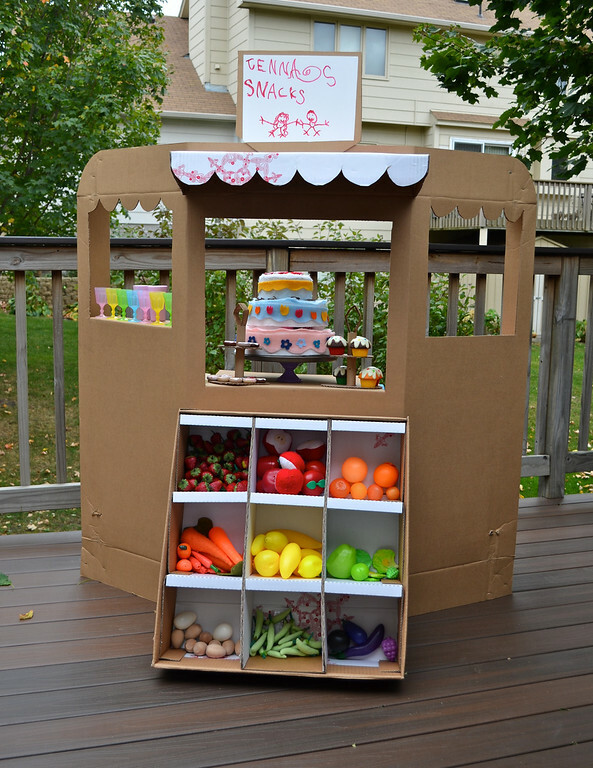 Oh my this took me back to when I made toys and when my children were little and loved them! 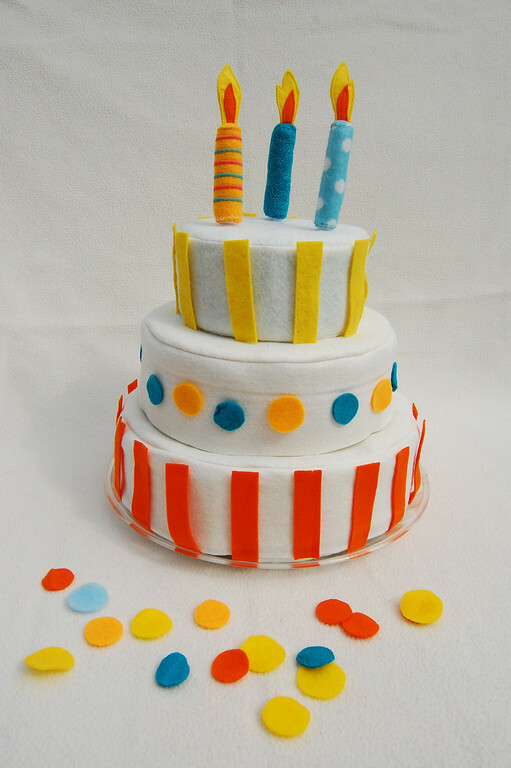 Your creations are beautiful and so fun to view...thank you for an extra-special post! Thank you for sharing your awesome creativity with us. I agree...WOW! 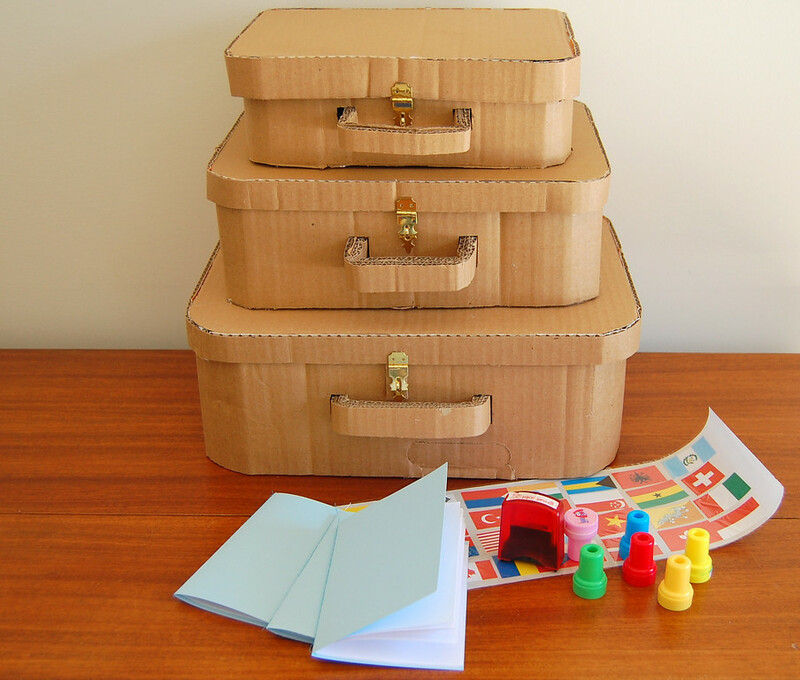 What a great legacy to give your children, designing and making things together! What a treasure! granddaughter who has limited speech at the moment . Since I was a speech therapist many years ago, I was looking for unusual items to bring to illicit speech. I am having so much fun creating some of your projects for her and greatfully appreciate your generous linking to other websites/blogs that would help. Thank you so very much. I have become a "follower"
OMG, you are one creative and hardworking Genius ! I am in awe of you ! You are amazing! I know that it took you many years to make all these fabulous toys but you are still an amazing artist. Your girls are quite lucky and will have the most amazing memories! I love all your posts, don't stop! Any word on what happened to the pizza making machine? All that creating, and still have the time to raise kids, run a household, blog and handle a million other things you do - truly i am awed to no end by your example. The pizza making machine is still around. We threw out the hood (it was detachable, anyway) but kept the conveyer belt portion. The girls don't use it anywhere as much as they use the actual pizza bits themselves. But it gets some use from time to time, whenever they feel like setting up the entire pizzeria (as opposed to just the pizzas as part of an all-service cafe that also offers desserts, beverages and produce).